Jackie Schlossberg and Ayla Johnston celebrate a goal in the Falcons’ 4-1 win over ODA. The Falcons completed a sweep last week, with both soccer teams winning 1A-District 7 soccer titles. The girls took a 2-1 lead into halftime on Thursday and added two more second-half goals to overwhelm Out-of-Door Academy, 4-1. It was the Falcons first district championship since 2014 and propels them into a regional quarterfinal on Tuesday (Feb. 5), when they’ll host First Baptist Academy. On Friday, the boys got a pair of gutsy goals from senior Noah LaBelle in overtime to top Bradenton Christian, 4-2, and capture their ninth consecutive district crown. The win also extended Saint Stephen’s unbeaten streak in district play that now dates back nearly a decade. Since the end of the 2009-10 season, the Falcons are an unbelievable 49-0-3 in district regular-season and tournament play. 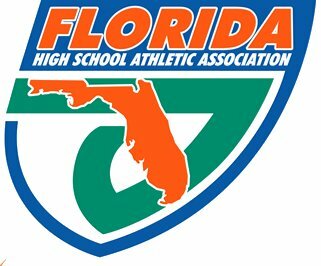 The boys open regional play at home on Wednesday night (Feb. 6) against Community School of Naples. Despite the dejection on the field after the Falcons fell, 35-14, to Orlando Christian Prep on Nov. 17 in the Sunshine State Athletic Conference Independent State Championship Game, the 2018 season might go down as SSES’s most noteworthy. It was a year that proved that Head Coach Tod Creneti and his staff have created a sustainable program. Few outside their own locker room expected these Falcons to go 10-2 and advance to their fourth straight state title game. With the graduation of uniquely talented players including Fred Billy, Demetrius Davis, Chase and Sydney Brown, SSES figured to struggle. Instead, new stars emerged, led by sophomore running back D.J. Clark (pictured), who rushed for nearly 1,500 yards and 19 touchdowns, and junior offensive/defensive lineman Dylan Davis. 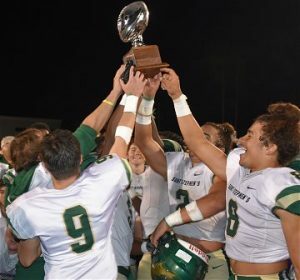 Although they weren’t able to capture the school’s third consecutive SSAC state title, the 2018 Falcons capped off a four-year run in which Saint Stephen’s is 41-5, with multiple division and conference crowns. Despite losing more than 90-percent of their offensive production from the previous year, the Falcons still averaged 35 points while allowing just 11 per game. Davis led the postseason awards list by collecting first-team honors on both the Florida Athletic Coaches Association All-District 16 team and the Sunshine State Athletic Conference All-Conference team. Clark and senior offensive lineman Dalton Francis were also chosen SSAC first team. Sophomore safety Calvin Sauerbeck was second-team all-conference. Creneti took the top honors as All-Star Coach in District 16 (Sarasota and Manatee counties) and was named the SSAC Coral League Coach of the Year. 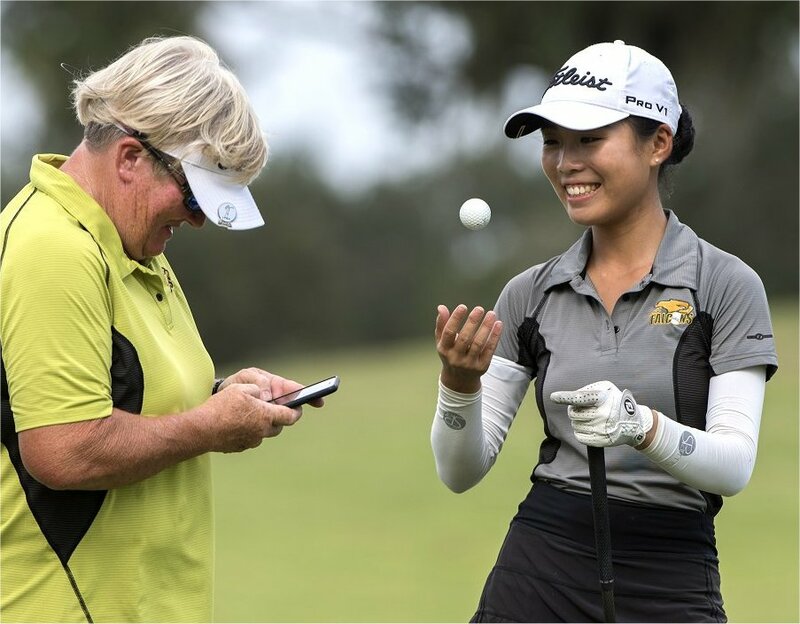 Led by sisters Maria and Catherine Huang, the SSES girls golf team finished in 10th place at the 2018 Class 1A State Championship Tournament, Oct. 30-31 at the Mission Inn Resort, Howey-in-the-Hills. The Falcons made their seventh consecutive state tournament appearance and improved on their 11th-place finish in 2017. The Huang sisters shot identical two-day totals of 161 to tie for 41st place individually. 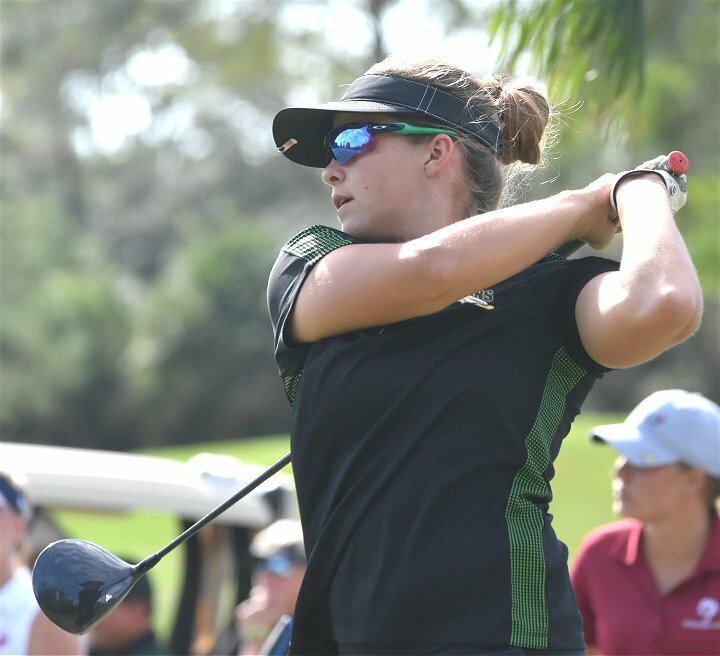 SSES improved eight strokes from the first day to the second, but was unable to make up enough ground to break into the top 10, finishing 12 shots behind Winter Park Circle Christian and 15 behind Tampa Prep. Orlando First Academy ran away with the team title, carding a 580 to win the tournament by 38 strokes. 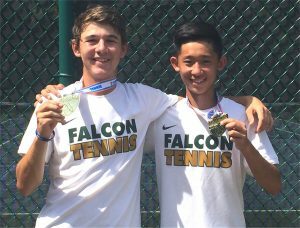 The state tournament trip was the culmination of another banner season for the Falcons, who captured their seventh consecutive district title and sixth regional crown in seven years. 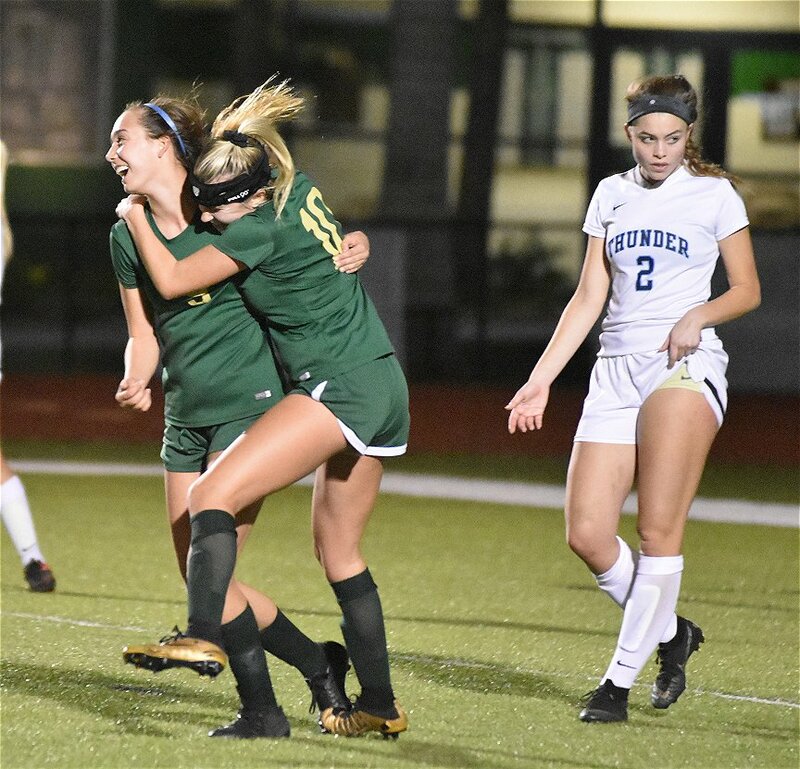 Saint Stephen’s has added another high-caliber coach with a championship resume to its already impressive roster with the hiring of Guy Virgilio to lead its girls soccer program. Virgilio comes to the Falcons from Lakewood Ranch High School, where he was the only coach in that program’s history, beginning with the 1999-2000 campaign. In 18 seasons, Virgilio led his teams to a record of 312-75-39, won 13 district championships, three regional championships, and appeared in three state Final Fours – the last time in 2014. 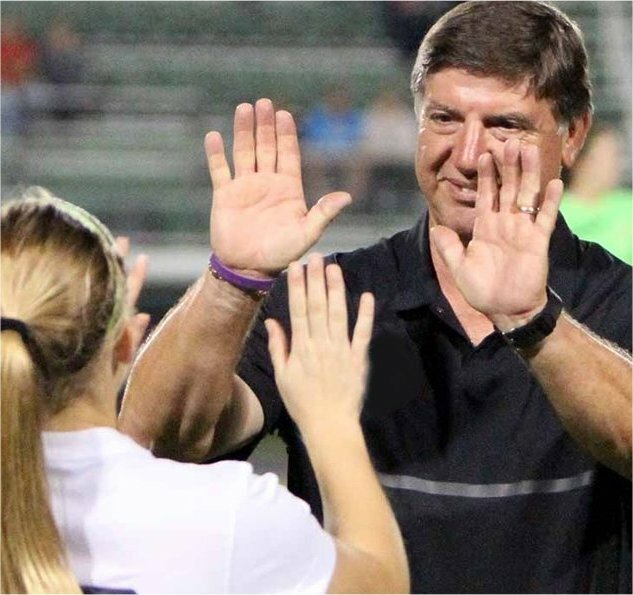 Virgilio also mentored a series of successful players during his tenure, including future Division I stars Gi Krstec (Maryland), Sarah Miller (USF), and Lindsay Thompson (Florida). He joins a soccer program at Saint Stephen’s that will now boast two of the most successful high school coaches in the state. Boys coach Marc Jones is the Manatee/Sarasota area’s all-time winningest coach with 375 career victories. Before entering coaching, Virgilio played collegiately at USF from 1978-81. He also coaches club soccer with the Braden River Soccer Club. Virgilio’s son, Alex, starred in soccer and football at Saint Stephen’s and currently plays football at Wingate University in North Carolina. Virgilio replaces Andrew Sopher, who is relocating out of state after two successful seasons leading the Falcons. SSES finished the 2017-18 campaign with a 10-5-2 record, a district runner-up finish, and regional appearance. Falcons Repeat as State Football Champions! Saint Stephen’s football completed an undefeated 2017 season and defended its Sunshine State Athletic Conference Independent State Championship with a 49-21 Florida Bowl win over Windermere Prep on Nov. 18 at the Master’s Academy in Oviedo. The Falcons (11-0) started fast with a 3-yard TD run by senior quarterback Fred Billy just more than two minutes into the game and never looked back, racing out to a 28-0 advantage and leading from wire to wire. Billy finished with 146 rushing yards, 49 passing yards and two touchdowns. 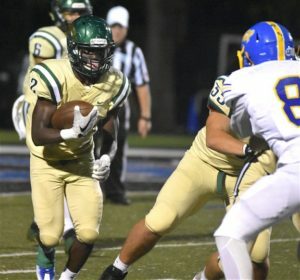 Senior running back Chase Brown was a dominant force, running for 201 yards and scoring five times – four on the ground and one on a pass reception that put the game out of reach in the fourth quarter. The Saint Stephen’s defense forced five turnovers with two interceptions, a fumble and two on downs. Junior offensive/defensive lineman Dalton Francis recovered two onside kicks and a fumble. He also made a huge tackle on a fourth-down run that yielded one of the turnovers on downs. The Falcons finished the season riding a 22-game winning streak. SSES has not lost since the opening week of the 2016 season. The Falcons outscored their 2017 opponents 529-83, averaging better than 48 points per game. The SSES girls and boys golf teams successfully defended their 1A-District 16 titles on Monday, Oct. 16, advancing to their respective regional tournaments on Oct. 23. The girls have now won six consecutive district crowns. Junior Alan Klenor led the boys at Tatum Ridge Golf Links, firing a 4-under par 68 as the Falcons carded a 7-under-par 281 to win the team title by eight strokes over Cardinal Mooney. All five Falcons scored par or better. Massimo Mbetse was 2-under at 70, Ryan Kinkead fired a 71 and David Hu and Song Bai each shot even par 72. SSES advances to the Region 6 tournament at the Ritz-Carlton Members Golf Club in Lakewood Ranch. Freshman Maria Huang paced the girls with a strong 75. Catherine Huang scored 81 and the Falcons finished with 375 as a team to win and move on to the regional tournament at San Carlos Country Club in Fort Myers. 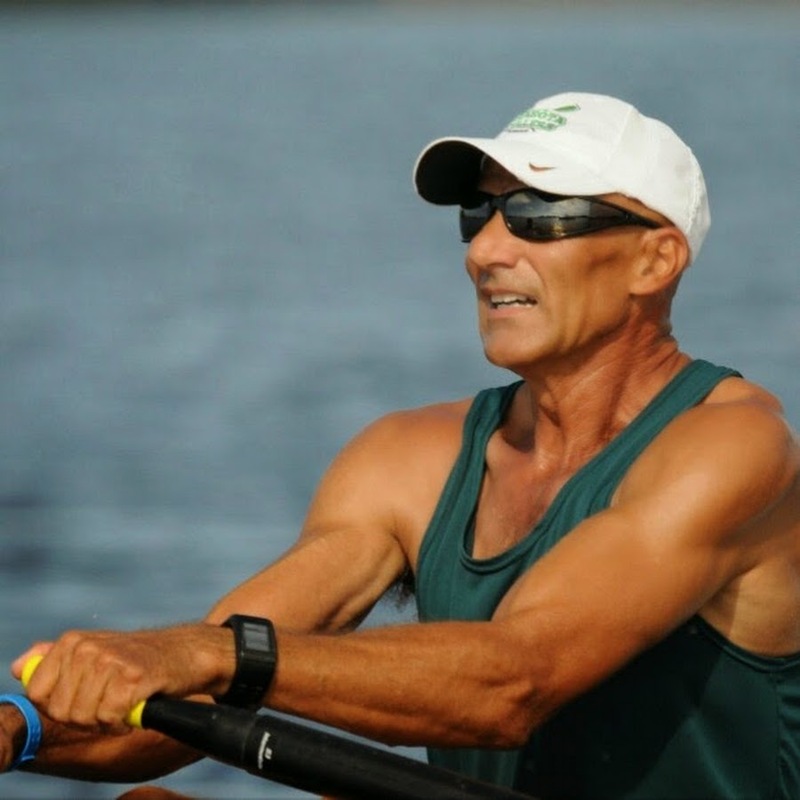 Saint Stephen’s is excited to announce that Dragos Alexandru has agreed to become the new head coach of the developing Falcon Rowing Team. Alexandru was a member of the 1980 Romanian Olympic rowing team that participated in Moscow and is a very recognizable name throughout the rowing community. He was one of the first advocates for the development of the current Benderson Park as a world-class rowing facility and played a very significant role in eventually bringing the World Rowing Championships to the area. He will now lead the Falcons as they continue to develop a competitive team. SSES rowing was launched in 2015 and has spent the past two seasons building skills and preparing to compete. You can read more about Coach Alexandru in this story from the Sarasota Herald-Tribune. 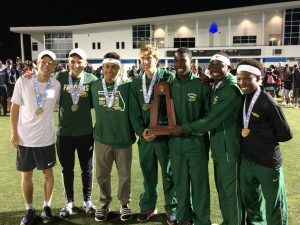 The Falcons followed up their first-ever district and regional titles with a Class 1A state track & field championship on May 6 at IMG Academy. Saint Stephen’s ran to a second-place finish in the 1,600-meter relay – the final event of the two-day meet – to finish with 42 team points and tie Fort Lauderdale Westminster Academy atop the standings, earning a share of the 1A crown. The Falcons won the team title despite not taking the top spot in any single event. SSES received second-place performances from Andrew Csubak in the 800, Letherio Jones Jr. in the 400, the 1,600-relay team and 3,200 relay. Csubak, who also ran both relays, added a bronze medal in the 1,600, and Henry Howell scored points with a fifth-place finish in the 800. The Falcons appeared to win their first gold medal in the 100 relay, cruising to the finish line in 43.46 seconds, but SSES was ultimately disqualified for an early handoff in the first exchange zone. Had Saint Stephen’s victory in that event stood, the Falcons would have been the outright champions — although the same could also be said about Westminster, which was also disqualified in the event for stepping out of its lane in the third exchange zone.